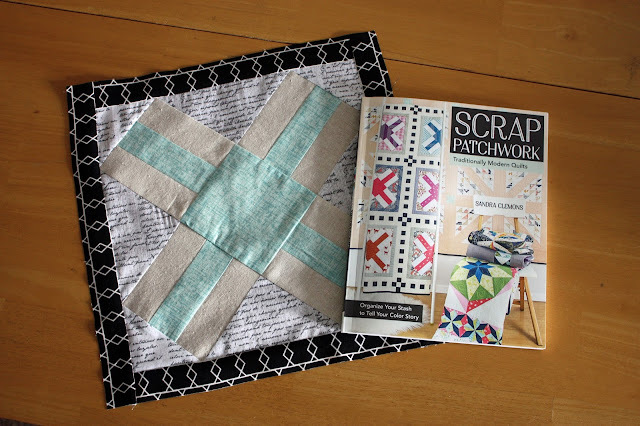 Scraps have been on my mind lately because I am working on TWO quilt that are using just scraps (you can journey along with me on Instagram to see one of the projects... I need to post pics of the other one, just click the little Instagram link at the top of this site, It's a cute little pink camera image). A long time ago when I just started quilting I didn't have many scraps. Well of course not because with each project you typically will only yield a few scraps. Lets also take into account that I famously ran out of fabric again and again so I would just use the fabric until it was GONE, COMPLETELY GONE. I remember I would often have to cut the selvage into the seam lines sometimes (and I still do here and there)!! Obviously when needing to sew the selvage in there aren't a lot of scraps. But years have passed and I started my pattern company and made a million quilts the scraps have happily multiplied. I organize my "SCRAPS" by warm and cool colors. It works wonderfully. 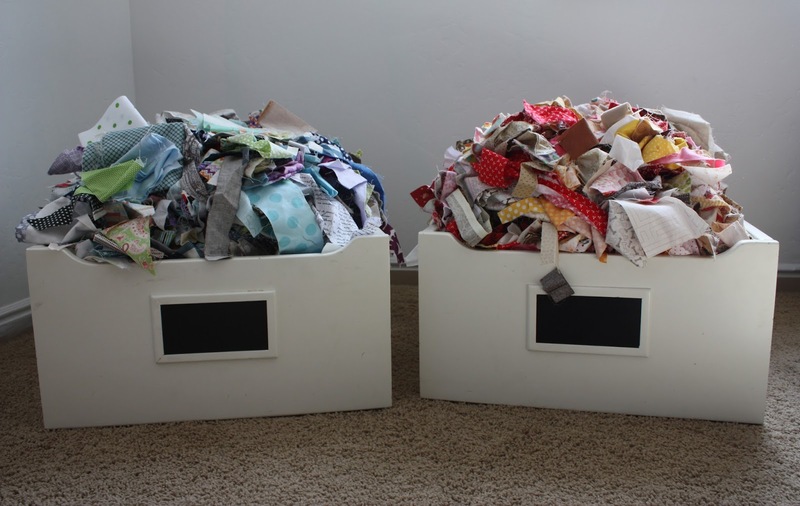 I have two bins that are filled from slivers of fabrics up to a few half yards. These are my scraps, not to be confused with my stash. My stash I house all my fat quarters and yardage in nice plastic bins in my closet, so when I tackle a larger project I will pull from those places. My STASH consists of fabric that hasn't been cut into yet. 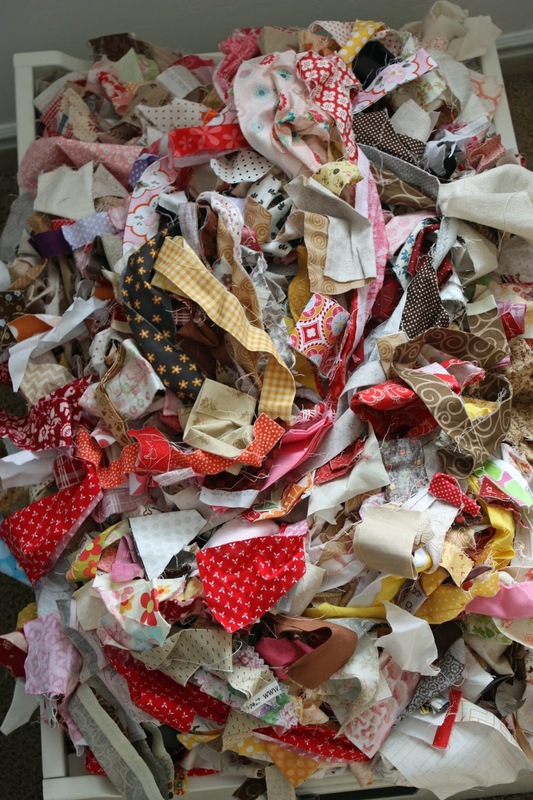 My scraps are from previous projects I have worked on and they are so USEFUL. When I am working on small things like pillows/gifts/appliqué projects I mainly pull from my scraps. I enjoy mixing this eclectic mix together to create the cutest darn things ever. I can't tell you how many times I dig into these two bins and add to these two bins and subtract from these two bins. They are ever changing. Even when I am working on a planned project at times I will insert some scraps. Sometimes you just need a tiny bit when working with appliqué and you can run to your scraps and grab a little piece of fabric and it will make the perfect petal or bloom or berry. You name it. It works. I feel like I worked hard for these scraps. They took money to buy and time to search for them, no doubt! They remind me of past projects I made for someone I care about. They are little memory triggers. I see a scrap and I usually know what project it is from or if I was gifted the fabric or where I picked it up from. I have a very sentimental mind. Scraps, Scraps, Scraps. I know I have mentioned that my scraps are so useful to me. However, I am to the point now where I can and need to actually make a full project from my scraps to edit them a little so they can be a little manageable for me to pull from. 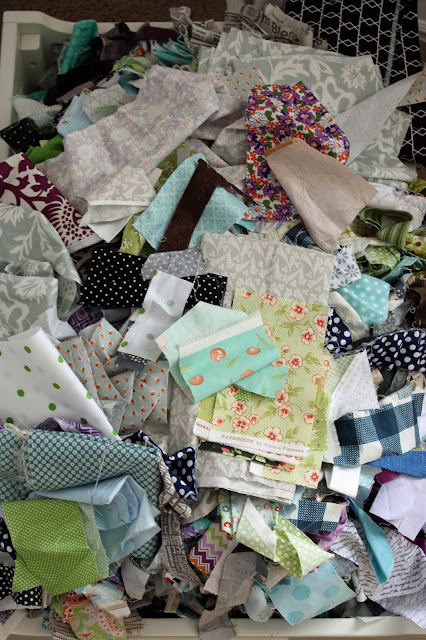 It is time to make a few scrappy quilts for this year. This has been on my mind for the last six months. 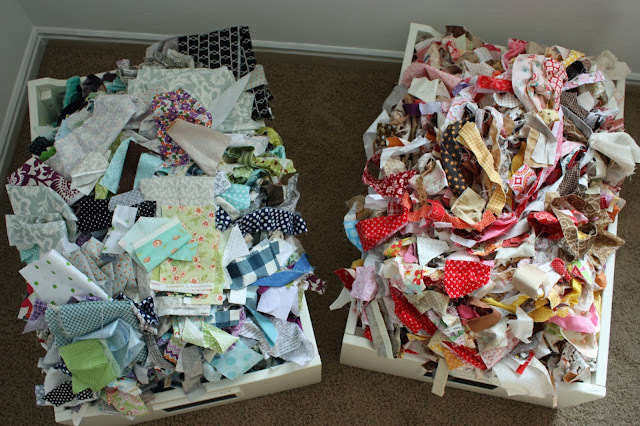 That is why I am working on two different scrappy quilts as we speak, but I have more plans! I need even more projects to put those scraps to good use. I have a few good ones in mind. To change gears a little I want to highlight a wonderful book that fits perfectly in with this post. This is a wonderful book for someone that might want to use their scraps. 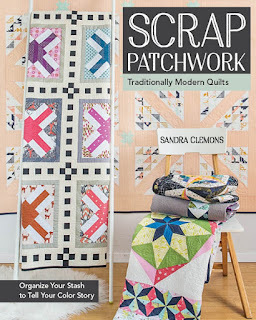 Alternatively, they could very well just make some of these patterns with intent and sans scraps because they are darn cute: Well, wouldn't you know that recently I have a friend Sandra Clemons, that I met through my Quilt Market ventures, that authored a book on scraps! So fun! 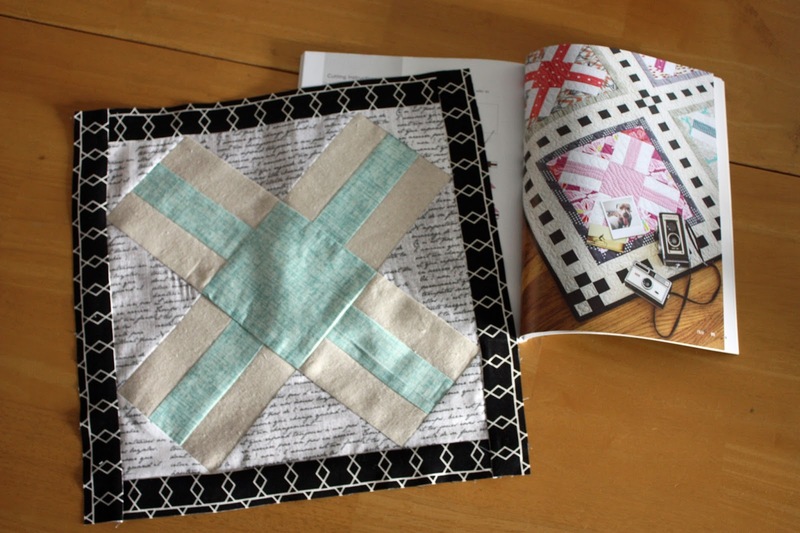 When she shared her book I jumped right in and made a little block intended for a pillow for my little girls room entirely from my scraps from this book shown in pic below. Cately picked out these fabrics from my scraps and I sewed this little baby up. I love this quilt pattern!! It is darling!! I plan on adding the cute border to make it a large throw pillow, so stay tuned. 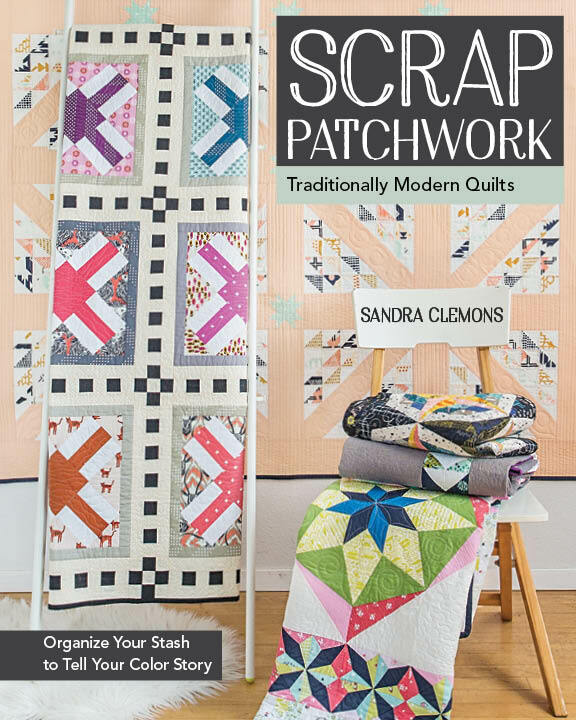 Sandra's book is entitled Scrap Patchwork. Below is a picture of the cover. My favorite quilt (FILM) happens to be on the cover and pictured to the right is my second favorite (PUGGLES)! Darling Quilt Patterns! I met Sandra at Quilt Market a few years back and it is so fun to see her published and to be witness to her growth in the Quilting Industry. It is encouraging to me having friends out there in this amazing business because I feel like we have hearts that beat the same and I feel happy to know that I am not the only crazy nut that wants to do this. That is awesome! I know that we are going to continue to see each other achievements and always take that time to celebrate each other. And that is what friends are for right. So, Hey go buy this cute book! Sandra is the bomb! She does not disappoint. Another thing that I enjoyed in Sandra's book was were she discussed Fabric Stash Shopping. There were so many points that hit home with myself. I live a good drive away from fabric shops and because of that it makes much more sense to have basics on hand so I avoid that extra trip. I have expanded my Etsy shop to offer fabric over the last year. I am pretty lucky in this aspect because I get first pick of all the amazing fabric that comes through my doors and that is great. Because I carry almost entirely pre-cuts, I will make quilts featuring fabric lines but those basics are essential to mix in. They break up that fabric line and add my COLOR STORY (how Sandra puts it). Because for me that is the point, to make something that is special to me. It is my stamp. So hooray for these scraps and hooray for my fabric stash. They make my job so much easier and make my quilts completely unique. Now to tackle some projects.